A fair and objective review of the $350 Oreck DualMax air purifiers is difficult because so much of the available material is advertising. Oreck Corporation got started around 1963 manufacturing upright vacuum cleaners for the U.S. hotel industry. Now more than 50,000 hotels around the world use Oreck products. Eventually the Oreck vac business got paired with an air purifier. Oreck products were traditionally sold direct on the web and in Oreck stores, but the company is now increasing its focus on big box retail. The Oreck store I visited had four air purifiers, one DualMax, two AirInstinct models (rebranded Coway HEPAs), and one obsolete XL, on display among the vacuums. A set of XL Truman Cell collector blades was out for inspection. The David Oreck infomercials, which ran for years, featured professional (not celebrity) hosts, air purifier testimonials from users, and Oreck products demonstrations by the company's charismatic founder, David. Millions of people love this guy, with his friendly flair, casual banter, gags used to bash competitors, and never-give-up optimism. The Oreck infomercial consistently placed in the top 10 in National Cable Infomercial Rankings for frequency viewed. I called David "America's best salesman", he was the brand. David is 94 years old in 2017, and the Oreck Corporation is remaking itself under new management. So this is not "David Oreck review", but the newer DualMax air purifier by Oreck review. Introduced in 2012, DualMax is an electrostatic air cleaner, using a doubled-up Truman Cell. The old Oreck decried HEPA filters, but the modernizing has resulted in some new product offerings with HEPA filters. The new Orecks, called "Airinstincts," are HEPA-filtered. There are about 70 DualMax user reviews online, with an average of 4.0 stars. At amazon.com, only 10% of DualMax buyers gave negative one and two star ratings. While the "Max" has few pro reviews, older impressions of the Truman cell are somewhat applicable. Consumer Reports bashed the old the Oreck XL for ozone emissions, with a definitive "not recommended" in the October 2005 Consumer Reports rankings. This was the real impetus for adding the ozone-reducing catalyst ("Helios Shield") to the Orecks. Air-Purifiers-America.com, which sells competing brands, tested an Oreck electrostatic air cleaner with their laser particle counter. In that report only 33% of particles passing through the air purifier were removed. 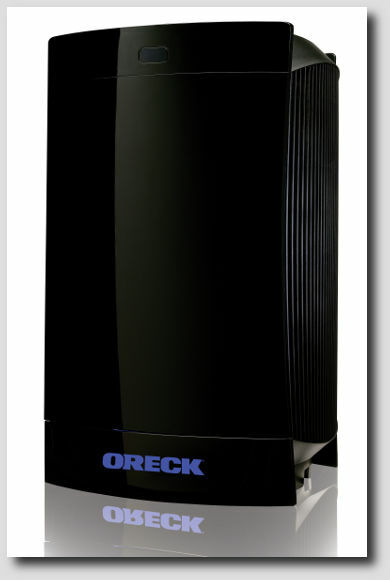 The DualMax air purifier by Oreck, though twice the size of the XL, is still a small electrostatic precipitator. Two muffin-type fans (similar to computer cooling fans) draw the airstream in through a permanent screen prefilter, which captures large fragments, dust, and hair. Next, airborne particles pick up a positive charge from electrified wires. The charged particles are attracted toward negatively charged collection plates, which Oreck calls their Truman Cell, where most of them stick. Purified air exits through a catalytic odor/ozone-reducing filter, the Helios Shield. The prefilter and collector (large yellow handle in photo) grids slide out for cleaning, while the catalytic filter is permanently affixed. The Oreck purifier is now marketed with more reasonable claims, including a manufacturer's room size suggestion of 200 square feet. Now let's try to estimate a proper room size for the Oreck DualMax. The new Oreck advertises AHAM (Association of Home Appliance Manufacturers) Clean Air Delivery Rate (CADR) numbers for the DualMax as "130 CADR." But no Orecks are currently listed by AHAM. I formerly estimated the old Oreck XL to have a similar CADR. I estimate a 140 sq. ft. room size rating (a medium bedroom), at the most, for the Oreck DualMax. Does Oreck DualMax Clean Air? Many readers may not notice the absence of efficiency specifications in Oreck literature. Top HEPA (IQAir) and quality electrostatic (Blueair) units capture 99.95% of particles to .16 micron. Again, the new Oreck management has dropped older misleading marketing practices. Electrostatic air cleaners, like Oreck's DualMax, sacrifice efficiency (ability to capture 100% of particles) for lower filter costs. Once the Truman grid is dirty, it collects "big" particles while letting finer ones slip by. These finest impurities are the most hazardous. All electrostatic air purifying machines have two design weaknesses. The first centers on rapid efficiency loss as collector plates become coated with impurities. Within a few days Oreck air cleaners begin to bypass impure air if not cleaned. But many dissatisfied users are those who fail to regularly clean their collector plates. The second weakness concerns efficiency loss on higher speeds. Airflow inside a closed vessel is not uniform, it is turbulent. Particle velocities are not constant. As particles tumble quickly by the collector plates, some have high enough speeds to escape the electrostatic attraction. The Oreck air cleaners' poor high speed air purification performance is even weaker when plates are electrically insulated by a coat of dirt. Oreck user reviews have always mentioned fine particle accumulation inside the purifier and on the exhaust grids. DualMax comes with a small brush intended for cleaning these post filter accumulations. This is evidence of bypassing, a lack of air-tightness. Note many inexpensive air cleaners share this problem. As true HEPA air filters clog they gain, not loose, efficiency. While DualMax Helios Shield catalytic grid does an acceptable job on light household odors, some buyers using the Max for smoking environments have expressed disappointment. Several user reviews mention improvement in pet odor situations. The catalyst is photo-activated by a series of small LED-like ultraviolet emitters. These can be extinguished by the user using the odor absorber button on the top panel. Note that this is NOT an odor "absorber," it is a photocatalytic oxidizer. So it has to be cleaned, how hard can that be? I have seen blogs by owners wanting to know how to clean Oreck air filters. Done very, very often, it stays easy. Buyers should realize they are trading their cleaning labor for the cost savings of not having replacement filters to buy. Oreck cautions users to unplug DualMax from the power supply before cleaning, and avoid handling any part with wet hands during assembly. The Truman Cell must he handled carefully, fine wires inside can be snapped by aggressive cleaning. It follows that these parts are NOT dishwasher safe. Remove the prefilter and Truman cell, which is locked in place by two large yellow knobs. Running water should be all that is required to loosen dust stuck on the prefilter. Soak the permanent filter in tap water with mild detergent or Oreck's proprietary cleaning fluid ("Assail-a-Cell") first. One user review reports success with Windex. Most households will find the grid will clean up fairly well, but cigarette and other smoke environments may foul the cell thickly, requiring laborious soaking/scrubbing. Buy if cleaning is delayed, even in non-smoking situations, oxidized films bond to the collector grid, making it difficult to clean. Once the grid is dirty and oxidized, pure exhaust air becomes an elusive goal. Electrical arcing, with sparks and popping noises may result. The Oreck purifier has an indicator light that tells you to clean the collector grid after 30 days. The DualMax User Guide suggests two to four weeks between cleanings. Under most non-smoking circumstances, I'd clean any electrostatic model at least weekly. There are some dielectric-coated grids that can go longer between cleanings (Intense Field Dielectrics, see Honeywell HFD series), but Orecks do not use IFD technology. Older Orecks would arc if reassembled damp, leading to early grid contact point failure. DualMax has been designed with a dry mode which senses dampness and runs the fans alone until the grid dries. I still recommend letting everything dry completely, like 24 hours completely, before reassembly. This is not a silent cleaning tool. Three fan settings are controlled a switch on the top panel. Low speed is claimed to generate 37 dB sound levels, but noise specs are not posted for the higher speeds. This low speed is quieter than many competitors, but several user reviews say high speed is excessively noisy. Users continue to report electrical zapping noises, especially when collector grids are dirty. Electrical "corona discharge" used to electrify (ionize) particles creates ozone, a dangerous oxidizing gas composed of three oxygen atoms. This ozone emission, despite the catalyst designed to limit it, is the DualMaxes main odor destroyer. Reports by Oreck users often refer to the improved odor. The typical purifier user review starts with: "A noticeable change in the air, a clean fresh scent." Ozone persists, decaying over three days to half its former levels. This makes it uncontrollable by the user. Many people will find even low levels uncomfortable. Asthma and allergy sufferers may report lessened symptoms, especially where toxic volatile organic chemicals (VOC), which are oxidized by ozone, form the foundation of their illness. But I don't recommend DualMax for the environmentally sensitive (MCS, fibromylagia, chronic fatigue syndrome). DualMax is reasonably compact, measuring 11.8 by 9.5 by 18.4 inches. The Oreck's weight of 15.7 lbs. makes transport between rooms a possibility. Cord reach is six feet, about average for an air purifier. DualMax is USEPA Energy Star Qualified. Oreck customer service has been getting improved marks from users, but the Tennessee call center has been downsized. Long phone waits are still occasionally reported. If you buy an air purifier from Oreck, be sure to keep all tracking numbers and return labels. Customers report higher service quality, and easier returns, at Oreck retail stores. But the retail centers do not repair Oreck air purifiers, they must be shipped for warranty work. While final packaging may be done in Cookville, the DualMax is made in China. 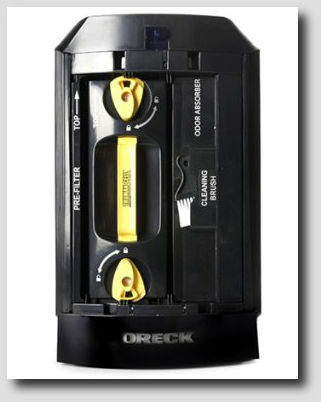 Reconditioned Oreck Air Cleaners are for sale at discount refurbished Oreck prices. There is a separate website for repaired Orecks. Oreck's DualMax air purifier, when purchased from from Oreck or an Oreck Authorized Retail Dealer, has a five-year warranty for residential users. Corporate headquarters in New Orleans, and the vacuum manufacturing plant in Long Beach, Mississippi were badly damaged by the big storm. Daily management duties fell to the son of the founder, CEO Tom Oreck. Katrina brought the company real problems, family management fought to save it. Oreck moved to Tennessee, with offices in Nashville and production/assembly and the call center in Cookeville. A series of refinancings and the challenge of the bagless vacuum cleaner revolution (Oreck makes mostly bagged vacuums) resulted in the restructured Oreck Corporation of today. The "New Oreck" is working hard to offer improved products and upgrade customer service. Their new reality is that today their main customer is a corporate buyer from a big box retailer, a very tough cookie. DualMax is an upgrade of the old style Oreck XL electrostatic model, a technology from the past. DualMax is suitable for people who don't want to buy paper filters and are willing to work hard to keep the grid squeaky clean. Those who fall for the "zero maintenance" fantasy will likely be disappointed. I'd try to get in on a "deal" on the DualMax, as prices appear to be softening after a year on the market.